As Bank Holidays go, Spring 2015 was pretty special for the city of Norwich. Fresh from hosting Radio 1's Big Weekend, a mass of yellow and green flocked to Wembley on Monday May 25 for the Championship play-off final against Middlesbrough. In a match worth mega money and instant Premier League promotion, it was the Canaries who came out victorious thanks to two quick-fire, first-half goals from Cameron Jerome and Nathan Redmond. This memorable victory and occasion is celebrated on our latest matchday programme cover for the game against the same opponents. The artwork is by local illustrator Richard Horne (also known as elhorno), who is now based in Norwich but originally from Middlesbrough! His colourful piece shows a pitch overview from that glorious day at Wembley including subtle references to the venue, opponents, date and result with the ‘2’ and ‘0’ from 2015 highlighted to emphasise 2-0 to Norwich City! 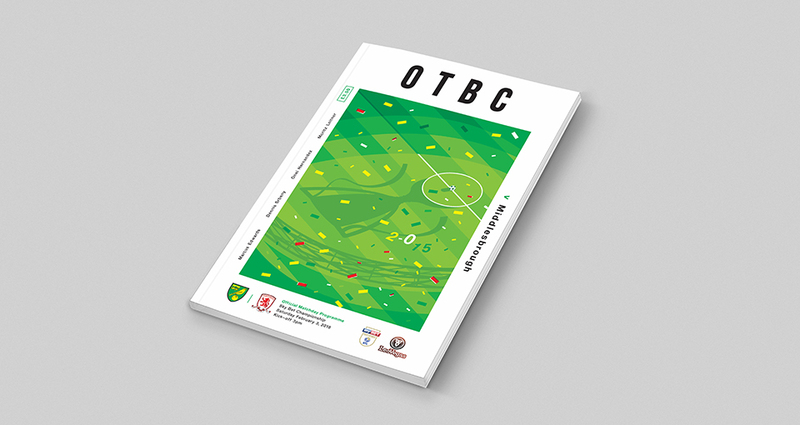 "Growing up in Middlesbrough but living now in Norwich, this was the perfect matchday cover for me to illustrate. As the Championship play-off game in the spring of 2015 was a winner-takes-all match, I wanted to refer to that memorable encounter by subtly bringing the setting of Wembley into the design and a sense of the grand occasion from a fans’ point of view in the stand. Win or lose, a trip to Wembley is something to celebrate. Of course, on the final whistle that day, it was Norwich who had the greatest cause to cheer (sorry for the reminder, fellow Boro fans!)."